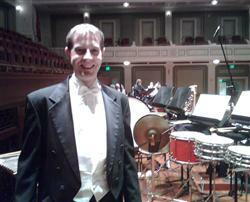 Scot Corey is a freelance drummer/percussionist who has performed as an ‘extra’ with the Nashville Symphony for over 10 years, including NSO's Carnegie Hall Debut and most recently, their Naxos recording of Piazzola's Sinfonia Buenos Aires. He has served as adjunct percussion faculty at Trevecca Nazarene University since 2000 and is a founding member of the Matrix Percussion Trio which has provided free educational concerts to 26,000+ students in the greater Nashville area (click here to see Matrix on YouTube). Scot began his professional career in 1985 as drummer/percussionist for musical theater. To date, he has played more than 40 different shows, including many at Cumberland County Playhouse and TPAC. Scot’s training includes a BM (Performance) from the University of Illinois, where he studied with Frederick D. Fairchild and Thomas Siwe – and an MA (Education – Music) from Tennessee Technological University, where he studied with Joseph Rasmussen. Since moving to Nashville, Scot has maintained a very active schedule as a freelance drummer/percussionist. Gigs range from percussion (Nashville Symphony, Nashville String Machine and Nashville Chamber Orchestra – including Bonnaroo 2004) – to Drumset/Loops/Percussion (various recording sessions/live gigs and Green Hill Church, Mt. Juliet) – to steel drums (Coral Bay Steel Drum Band) – to ethnic percussion (Som Brasileiro – nine-piece Brazilian band). Scot is extremely proud to endorse Innovative Percussion sticks and mallets – he purchased his first set of four IP mallets as a Graduate Student in 1993 and still uses those same mallets to this day – now that’s a quality product! Listen to an interview with Scot from the Working Drummer Podcast here!